Lafe Cook has been a high school band director for twenty-six years and is in his twentieth year as the Director of the Dobyns-Bennett Band Program in Kingsport, Tennessee. Mr. Cook is a graduate of the University of Tennessee, Knoxville where he was drum major of the Pride of the Southland Marching Band and a graduate assistant with the music department. He taught at E.C. Glass High School in Lynchburg, Virginia for six years prior to coming to Dobyns-Bennett. Mr. Cook’s teaching responsibilities at Dobyns-Bennett High School include directing the Wind Symphony, the Marching Band, and administering the 350 member band program. He currently serves as the Supervisor of Secondary Bands for Kingsport City Schools. He also has served two terms on the board of directors for the Kingsport Ballet and he currently serves the City of Kingsport as a liaison with city government regarding improvements in Kingsport’s arts and entertainment infrastructure and atmosphere. Mr. Cook is Past President of the East Tennessee State Band and Orchestra Association and is President Elect of the Tennessee Music Education Association. Ryan Gilbert has been teaching since 1997 and has served as the Associate Director of Bands at Dobyns-Bennett High School since 2002. He received his Bachelor's in Music Education from Lee University and his Master's in Education from Tusculum College. Mr. Gilbert has arranged the marching band music for eleven shows performed by the Dobyns-Bennett Marching Band. These shows have produced numerous first place awards including two Governor's Cup wins at the Contest of Champions, and a first place in music at a Bands of America Regional. Mr. Gilbert's teaching responsibilities include Music Technology, AP Music Theory, Marching Band, and director of the Symphonic Band. Mr. Gilbert's theory students have typically maintained 95% passing rate on the AP exam since he began teaching the course in 2002. His concert bands have received superior ratings every year they have participated in concert festival. Ryan resides in Kingsport with his wife Mollie and daughters Ellie and Gwyn. Ellie is a junior flute player in the Dobyns-Bennett Wind Symphony. Turner Hawkins joins the Dobyns-Bennett team as Assistant Director of Bands starting in the 2017-2018 school year. Mr. Hawkins' undergraduate studies were completed at Transylvania University in Lexington, Kentucky, focusing on Music Education and Bassoon Performance. Outside of school, he stays involved with Drum Corps International (which he participated in for four summers) serving as the Low Brass Coordinator for the Oregon Crusaders Drum and Bugle Corps from Portland, OR, and is entering the world of the Winter Guard International Winds division, working with Redline Winds from Greenville, SC. His professional affiliations include the East Tennessee State Band and Orchestra Association and NAfME. A third generation band director, Mr. Hawkins is thrilled to be continuing the family legacy at one of the premier band programs in the United States. Dave Whaley, Percussion Director for Dobyns-Bennett High School, began working with the program in 2009. Dave is a graduate of East Tennessee State University, and he has performed at Carnegie Hall and several Percussive Arts Society International Conventions. In 2005, he was a member of the ETSU percussion ensemble that took first place in the small ensemble division of the PASIC Marching Festival. Dave has spent time working with several other high schools in the region, and most recently served as the Percussion Director at Tennessee High School in Bristol, TN. His professional affiliations include the East Tennessee Band and Orchestra Association and the Percussive Arts Society. Davis is also proud to be a part of the educations family at Innovative Percussion. Dave resides in Elizabethton with his wife Jen and daughters, Dylan and Kennedy. Jed Garvey currently resides in Johnson City Tennessee where he is the program director for Girls Inc. of Kingsport. Jed graduated from East Tennessee State University with a bachelor’s degree in language and literature, as well as a certificate of specialization in technical writing. Jed’s marching experience includes the Glassmen Drum and Bugle Corps, Southeast Independent Winterguard, Etude Winterguard, and three-time WGI World Champions, Onyx. 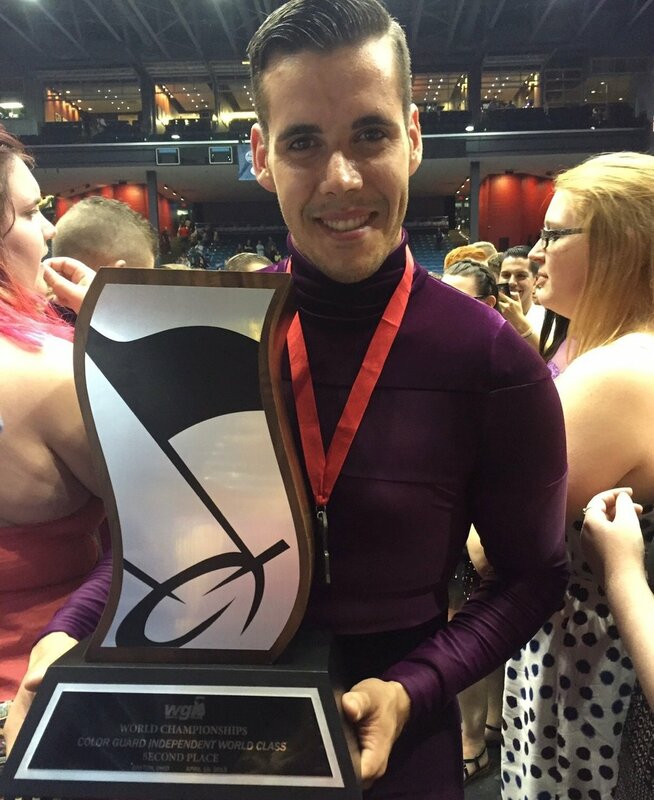 As well as teaching the Dobyns-Bennett color guard, Jed serves as a choreographer for Byrnes High School, Etude Winterguard, Juxtaposition Winterguard, Pacific Crest Drum and Bugle Corps, and the Colts Drum and Bugle Corps. Avery Peters has served as a Marching Band Percussion Technician and an assistant with the Percussion Ensemble at Dobyns-Bennett since 2015. Avery is an alumni of Dobyns-Bennett High School and a graduate of Northeast State. Avery has performed with DB Wind Ensemble at Carnegie Hall along with performing at the Rose Bowl Parade, Macy's Day Parade, and Inaugural Parade. Avery has also performed with the Symphony of the Mountains Orchestra and the Percussion Ensemble at Dobyns-Bennett, where he performed in Tennessee Days of Percussion and other show cases.